I love crocheting with different things and embroidery cotton gives a beautiful luxury finish perfect for gifts. This little purse is quick to make from readily available supplies, with a modern color block style. Filled with beads or buttons it would make the ideal gift for a crafty friend or relative. I choose colors that remind me of the sea on a misty morning, but it would also look fabulous in vibrant primary shades, or sophisticated black and white. Stranded cotton thread, e.g. Anchor or DMC [100% cotton; 8m/8.7yds per skein], 2 skeins each of 5 colors. Gauge: Gauge is not critical in this design, although those with very tight or very loose gauge may need to adjust the length of the zipper. Note: This pattern is worked in 6 strands of embroidery cotton to produce a light silky fabric perfect for small accessories. By working the pattern in thicker wool, with the appropriate size hook, a larger purse or small clutch can be made. FPtr (Front Post treble): YO twice, hook around post of stitch two rows below working from the front, to the back and round to the front again. (YO and pull through two loops on hook) 3 times. Row 1: With first color ch 62. Make 1 dc in the 5th chain from the hook; work one dc in each ch across. Turn. Row 2: Ch 3 (counts as first dc), skip first dc. Make 1 dc in each dc across until last dc. Dc in top of turning chain. Turn, change color. Row 3: Ch 3; skip first dc, 1 dc in next dc. *(FPtr in next dc, dc in next dc) 3 times, make 1 dc in next 4 dc. Rep from * 6 times, ending the last repeat with 2 dc, not 4. Turn. Row 5: Ch 3; skip first dc. Dc in next 6 dc. *(FPtr in next dc, dc in next dc) 3 times. Dc in next 4 dc. Rep from * across. End with 1 dc in each of next 3 dc. Rows 6-10: Repeat Rows 2-5, changing colors every two rows, until the end of Row 10. Fasten off. Fold the purse down the vertical center line with the wrong sides facing out. Using small neat stitches (in the same color thread as your embroidery cotton) attach zipper to the top. 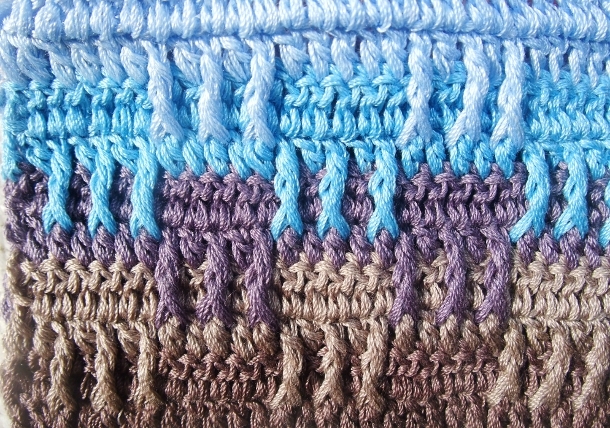 I used a whip stitch, placing one stitch in each crochet loop for a tidy finish. Sew up the side and bottom. 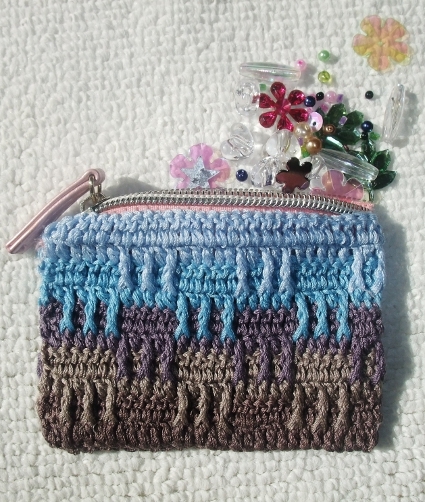 This could also be lined – there are many great online tutorials for lining crochet bags and purses. 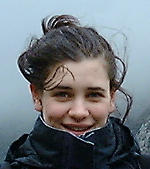 Jo Wolforth lives in Yorkshire in the UK with her husband and two young children. This is only the second design she’s submitted to anything but she hopes it won’t be the last! Pattern & images © Jo Wolforth. All rights reserved.